Attention: Mandeville Suite has been cleared and has re-opened. The suite is not available for weekend use. All Friday events must end by 4:30 p.m. The suite is also unavailable during university observed holidays and breaks between quarters. Use during the summer is by exception only. For additional information, please contact the Muir Provost's Office at mandevillesuite@ucsd.edu or ext. 4-7127. The suite is a large apartment on the 11th floor of Tioga hall, at Muir College. It is ideal for departmental receptions, retreats, or staff meetings. Maximum attendance is 50 for events where people will be standing and socializing; far fewer can be comfortably seated. It has a large living room, full kitchen, one bedroom with a king-size bed, and a private patio on the west side with a view of the ocean. Departments can have visiting faculty stay overnight, however, no overnight guests are allowed on the same day as an event is scheduled. Stays are limited to maximum two people and overnight visits will be limited to three nights. No children under 18 are allowed in the suite at any time. Please also note that the patio on the east side is accessible to all residents of the building for use. The Mandeville Suite was a gift to John Muir College from Mr. Ernest W. Mandeville. It is hoped that individuals who use the suite would consider it as an extension of their home and exercise the same degree of care and responsibility as they would in their home. 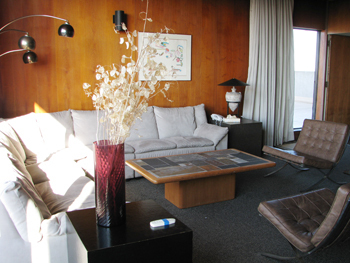 In this way, the suite will remain in good condition and provide a comfortable place for all its visitors. To reserve the Mandeville Suite, please submit the Reservation Request Form two weeks prior to your event.